Department of Art | Internship & Apprenticeship Opportunities at Contemporary Craft – paid summer internship! Studio arts management apprenticeship! 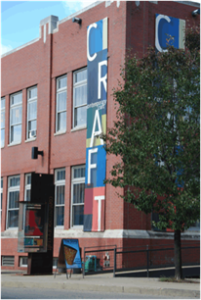 Home » Internship & Apprenticeship Opportunities at Contemporary Craft – paid summer internship! Studio arts management apprenticeship! Internship & Apprenticeship Opportunities at Contemporary Craft – paid summer internship! Studio arts management apprenticeship! Internship and Apprenticeship are accepting applications for summer and year long programs. Both offer stipends and experience in contemporary crafts as well as involvement with the community. Check below for ways of how to apply and application dates. Businesswoman and previous President of the SCC Board, Judy Cheteyan, has been an invaluable asset to the arts community in Pittsburgh. Both Judy and her husband Michael believe that the arts and education make for a stronger community; therefore, affordable exposure to both is crucial for citizens. The Judy Cheteyan Scholarship Fund is an annual paid summer internship offered through Contemporary Craft that provides a college or graduate student with the opportunity to gain professional experience within an internationally known contemporary craft organization. The scholarship will be used to pay a $3,000 stipend to the student during the internship. The deadline to apply is March 15, 2014. The Society for Contemporary Craft is offering a yearlong studio apprenticeship to an emerging artist seeking to develop professional studio management skills by working with one of the nation’s only nonprofits focusing exclusively on creation, exhibition, and education across all contemporary craft media. The apprentice scholarship offers a monthly stipend and an additional $300 per month housing allowance. This opportunity will provide a young artist with tools to be successful through mentoring from SCC staff and visiting artists, professional development, and networking opportunities. If you would like more information on these opportunities, email info@contemporarycraft.org.